Stocks strengthened worldwide as strong manufacturing data out of the world’s second largest economy helped allay investor concern about a slowdown in global growth. Yields on Treasuries rose the most since January after as a gauge of U.S. factories topped estimates in March. The S&P 500 closed at the highest level since October, while the Dow gained the most since Feb. 15. Shares of Lyft dropped below its IPO price as analysts noted there is limited visibility into the company’s path to growth and profitability. The Stoxx Europe 600 climbed on the heels of its best quarter in four years after key China manufacturing PMIs for March beat the highest estimate in Bloomberg surveys of economists. That’s despite manufacturing data for Europe coming in at the lowest since 2013. 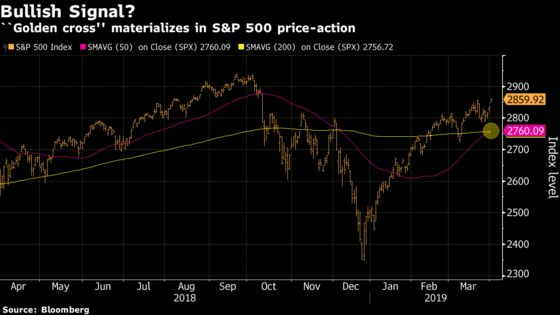 “This is good news for investors wondering what the next catalyst for stocks will be in 2019,” wrote Nancy Tengler, chief investment strategist at Tengler Wealth Management, in an email. In Asia, Chinese shares surged to the highest since May, while Hong Kong stocks entered a bull market. The yen declined, while the Turkish lira fluctuated as preliminary results from the weekend’s municipal elections showed the popularity of President Recep Tayyip Erdogan is being tested. Global equities are building on their strongest quarter since 2010 amid bets that dovish tilts by major central banks will help prop up earnings. The Chinese data went some way toward easing worries about a slowdown prior to the release of American monthly jobs numbers at the end of the week. U.S.-China trade talks will resume when Vice Premier Liu He leads a delegation to Washington later this week, potentially offering more positive developments for investors. Elsewhere, the pound extended its gain as U.K. factory data reached a 13-month high on Brexit stockpiling and as lawmakers prepare to vote on alternative options to replace Prime Minister Theresa May’s divorce plan. The Reserve Bank of Australia decides on monetary policy Tuesday at a time of falling growth forecasts. Then Australia will release its federal budget that evening. Chinese Vice Premier Liu He leads a delegation of trade negotiators to Washington on Wednesday, days after U.S. Treasury Secretary Steven Mnuchin and Trade Representative Robert Lighthizer traveled to Beijing. The monthly U.S. jobs report on Friday is projected to show nonfarm payrolls up 175,000 in March, similar to the 186,000 average over the prior three months, after recent readings whipsawed analysts. Economists think the jobless rate held at 3.8 percent with hourly earnings growing at a strong clip. The S&P 500 Index rose 1.2 percent to 2,867. 19 as of 4:03 p.m. New York time, while the Nasdaq Composite Index gained 1.3 percent and the Dow Jones Industrial Average climbed 1.3 percent. The Stoxx Europe 600 rose 1.2 percent. The MSCI Emerging Market Index increased 1.2 percent. The MSCI Asia Pacific Index rose 1 percent. The Bloomberg Dollar Spot Index eased less than 0.1 percent, the first drop in five trading sessions. The euro was little changed at $1.1212, while the yen weakened 0.4 percent to 111.35 per dollar. The British pound gained 0.6 percent to $1.3113. The MSCI Emerging Markets Currency Index rose 0.4 percent. The yield on 10-year Treasuries jumped nine basis points to 2.49 percent, the biggest one-day increase since January. Germany’s 10-year yield climbed four basis points to negative 0.03 percent. Britain’s 10-year yield rose five basis points to 1.05 percent. West Texas Intermediate rose 1.5 percent to $61.64 a barrel. Gold fell 0.3 percent to $1,289 an ounce. The Bloomberg Commodity Index rose 0.7 percent, the first increase in four sessions.